Description: Celebrate a Wedding, Honeymoon, Anniversary, Birthday or Special Occasion in my Honeymoon Suite. My King Suite (Honeymoon) is the larger room (19.8' x 13.5')of my 2 Bedroom Suite which includes King Bed, Ensuite Bathroom with Tub/Shower, sitting area with Gas Fireplace, Ceiling Fan, Air Conditioning, 32` TV., Vcr, Fridge, Coffee Maker, Kettle, Toaster, Private deck and entrance. I serve a hot Breakfast in the privacy of your Suite, so you can relax in front of the Fireplace or sit out on your Private deck and enjoy the view of the Niagara Gorge. I will be glad to add extras in your Suite like champagne,Chocolate covered Strawberries, Flowers, Fruit Baskets etc. for additional charges. A reservation for 3 Nights in the King Suite for 2 people will include one complimentary $30 Dinner Voucher for Carpaccios or Mama Mias Restaurants, Free Wine tasting at several Wineries plus discounts for local attractions. Breakfast is served in the privacy of your Suite in front of the Fireplace. $706.25 including tax for 2 Adults. Bathroom Description: 4 Pc Ensuite Bathroom with Tub/Shower:Includes Towels, liquid soap, shampoo, body wash, hair dryer and iron. Description: Enjoy a peaceful night's sleep, on a new quilted mattress in the Large Antique Double Bed. (11.0' x 11.5'). You will enjoy the luxury of your own 3-piece en-suite bathroom, along with ceiling fan, air condition, cable 32` TV and wireless internet. You may also choose to get to know the other guests in the living room, with stories of travel in front of a warm and inviting fireplace. Other amenities include 42` TV with DVD player, computer, small fridge, microwave, kettle and complimentary tea and coffee, all located in the downstairs area. A reservation for 3 Nights for 2 people will include one complimentary $30 Dinner Voucher for for Carpaccios or Mama Mias Restaurants, Free Wine tasting at several Wineries plus discounts for local attractions. * I am able to accommodate up to 8 people, when you reserve all 4 rooms with total privacy. Bathroom Description: 3 Piece Private Ensuite Bathroom with Shower. * Includes Towels, soap, shampoo, body wash, hair dryer & iron. Description: Snuggle up and dream away in the Antique Queen Bed on a comfy pillow top mattress. 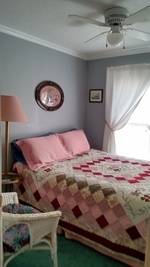 This antique bedroom also comes equipped with an antique dresser, rocking chair, ceiling fan, air conditioner, closet and bathrobes for your enjoyment. Located a few steps down the hall is your `Newly Renovated` Private 3-piece bathroom with shower. You are welcome to make yourself comfortable in the living room (12x24.5) or front porch. Bathroom Description: Newly Renovated Private Bathroom with Shower is outside the room in Hall. The Queen Ensuite is the adjoining smaller room (8.11x9.0) of the 2 Bedroom Suite. You will be refreshed after a good night's sleep on a cozy pillow top queen size mattress. Enjoy the luxury of your own 3-piece Large en-suite bathroom, along with ceiling fan, air condition, cable TV and wireless internet. You may also choose to get to know the other guests in the common living room, with stories of travel in front of a warm and inviting fireplace. Bathroom Description: Large 3 piece Ensuite bathroom with shower and wardrobe. (19.8'x13.5') is perfect for a vacation with the family or that special honeymoon. Dream your night away in our large King size bed or easily separate it into two Twin size beds. This romantic suite includes an en-suite 4-piece bathroom, sitting area with tranquil gas fireplace, 32 TV, fridge, coffee maker, kettle, toaster, microwave, ceiling fan, air conditioner, and a private deck and entrance. The adjoining smaller room (8.11'x9.0') is ideal for a family getaway with a cozy pillow top queen size bed and large en-suite 3-piece bathroom. The room also includes a TV, ceiling fan and air conditioner allowing your children to feel comfortable and safe. The suite allows up to 4 people with the privacy of their own rooms. *Check out my other rooms to accommodate additional people. A reservation for 3 Nights in the 2 Bedroom Suite for up to 4 people will include a complimentary $60 Dinner Voucher for a choice of Carpaccios or Mama Mias Restaurants, Free Wine tasting at several Wineries plus discounts for local attractions. Bathroom Description: 2 Private Ensuite Bathrooms with Shower and Tub/Shower.